Editor’s Note: The following is an edited excerpt from a speech given by Okabayashi Sensei given at his organization’s annual Fukuoka seminar several years ago. Okabayashi offers a unique vantage point to discuss aiki-jujutsu, having studied Daito ryu Aiki-jujutsu under its two best known modern proponents, the late Takeda Tokimune, 36th Soke (son of Takeda Sokaku, 35th successor within the system who first popularized the art), and Hisa Takuma, Menkyo Kaiden of Daito Ryu (one of only two people Sokaku Sensei ever awarded this rank to). Daito-ryu is the foundation art from which various schools of aiki-jujutsu trace their lineage. Readers might also see: Seeking The Original Path: An Interview With Daito-Ryu’s Okabayashi and Daito-Ryu. It is very hard to express aiki-jujutsu in words, but I will give it my best effort. I expect that everyone here wants to become stronger, but have you ever considered exactly how strong is strong enough? Is it enough to be the best or strongest in your neighborhood? Or would you like to be strongest in your city? Or is it the strongest in the State/prefecture? Maybe the country? This type of goal is what I call a “relative” desire; it will disappear at the same time (and only when) the “relative” existence does. Okabayashi Sensei throws an attacker almost effortlessly. In our organization there are people ranging from five to eighty nine in age who are training diligently. Along these “relative” lines, if there were a competitive arena that recognized 89 year old fighters, our 89 year old practitioner would definitely be in the top fifty in the country. Most definitely he would be number one in the prefecture. However, in reality this is not the level or reasoning with which we train. This is because aiki-jujutsu requires us to have the idea of capturing the single “absolute” moment in time and space that exists for just a split second in any relative situation. Everyone here has probably experienced at some time or another in their lives the realization of just how prevalent these concepts of relativity are in everything we do. Aiki-jujutsu is fundamentally different from other fighting arts because of the very fact that it doesn’t put its main emphasis in relative principles, but rather it puts its focus on how to benefit from capturing this “absolute” instant of time and space created somewhere during the period of mutual contact between you and the opponent. Editor’s Note: Okabayashi now uses the term aiki-budo rather than Daito-ryu. He changed the name because he felt the philosophical and historical foundations of the style as practiced in many modern organizations has diverged from the original. Okabayashi also wanted to avoid the politics of the art and as confusion with other groups that practice aiki-jujutsu techniques using modern body movements, or those groups born from totally different origins that are Daito-ryu in name only. The Chuden level (the level of techniques above shoden) (3) of aiki-no-jutsu is something that enters into an area that goes beyond the relative. To teach aiki to a youth whose body is not yet trained and whose spirit is still soft and weak will not amount to anything useful. Jujutsu is much better for gaining control of one or two unreasonable people. People who are young and have the strength of youth quickly become enchanted with these strong competitive aspects of jujutsu. However, it is no good to push on to go further in your training at this relative level. While training yourself and your body to a certain level in the relative world, you need to start your quest for the absolute world. At right, Okabayashi demonstrates a technique from Onno-ha Itto-ryu Kenjutsu. Students within Hakuho-ryu also study this art since it is complementary to the aiki-jujutsu taught. Both too utilize the same principles of body movement – relaxation of external musculature, moving along a single line while eliminating any body twist, along with the use of gravity and the internal hinges of the body to create the driving force behind most movement. This unique movement, once central to advanced levels of the classical sword, is very different from the body movement now found within modern martial arts including jujutsu. Older practitioners, because they have an abundance of life experiences to draw from, are at a point where they can understand the idea of incorporating this created “absolute world,” and this “absolute moment” of time and space into their jujutsu. This is the practice of aiki-jujutsu. 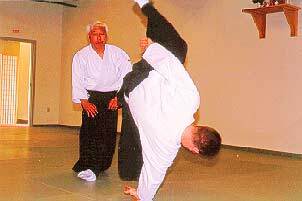 This flexibility in the technical makeup of aiki-budo (using aiki-jujutsu) is a magnificent thing. Even though we say that the shoden techniques are jujutsu, they are designed in such a way that by adding or reducing strength and power, moving faster or slower, drilling with or without putting in aiki, many various types of practice are possible. From the time someone enters the Hakuho ryu we explain the idea of aiki in an easy to understand way, make clear the foundational principles of Kobudo (the classical fighting arts of Japan); and incorporate the concepts of aiki into our jujutsu to train in aiki-jujutsu. Even this does not seem to prevent people from being stiff and using strength, and this usually causes them to forget other very important elements such as angles, skin sensitivity, and breathing. Trying to steal (understand) (4) technique from things like video is almost the same; you cannot understand anything deeper than the points of the form you see. However, even if you practice at this lowest level by using only the form and your own strength, you can become very strong in the relative world. If you were to practice just one hour a day, every day for three years, you would become quite strong. If you consider the fact that in the relative would various rules exist, you could probably ready a level high enough for you to make a living from life in the ring. You can train your body to quite a formidable level of strength by using the shoden of aiki- jujutsu also. No matter how strong you train the muscles in your body, however, it is of little value when it comes to using aiki. This is because aiki is a system made for negating strength (external), and therefore it is impossible to remain in the world of relative strength and do aiki. Also, in order for you to understand aiki it is necessary for you to transcend the idea of winning or losing. While fully acknowledging this, however, practitioners still have a tendency to dwell on winning and losing. In reality it is this dwelling on winning and losing that forms an unnecessary barrier to their real progress. I would like everyone to change their consciousness away from this idea of who is number one, two, etc., and try to capture the phenomena of the “absolute moment.” It is a pursuit that is very different from the fighting arts that compete over who is number one, or two; 5,000 or 5,001. The first priority you have is self-defense. There is no room for the entry of relative matters of strong or weak in self-defense situations. Rather, no matter how weak a person may seem or how strong they make themselves out to be, you must train mastery over them in the same way. Along these lines it was originally not allowed to show even one part of a technique to someone outside your fellow disciples. This was because you did not want to give your opponent the ability to even imagine what type of technique you might use. Perhaps the reason we only see the occurrence of aiki (real aiki) in Japan lies in the traditional way our ancestors lived without carrying any offensive or attacking nature. Arts that contain these traditional roots and follow this path are what we should call Kobudo. Should aiki-jujutsu or daito-ryu groups that inorganically combine one technique to another and move with modern sport-like twisting of the body really call themselves aiki-jujutsu or daito-ryu? At the very least we must not confuse ourselves with these people who copy only the outer layer of its technique. To know only the form of a technique is not sufficient. You should try to get to the bottom of the very roots that make up the technique and then begin to work on using it. I have said before that you can become strong just with jujutsu, but it is also necessary for you to gain an understanding of the reasons why the kata (separate technique sequences) (5) have the effects they have on the attacker. Failing to do this will block your path to understanding aiki. This requires that you continue to keep reducing the amount of strength you use in your technique. Depending on the strength you use, the ability of your consciousness to capture multi-faceted things such as angles and direction with your skin sensitivity is cut down, and this prevents you from understanding the reasons behind the technique. It could be said that this is the time when you cross with the spheres of the supernatural: the aiki which causes and finishes the absolute moment is like a vision or a phantom that has no real form or shape to grab hold of. There is no place to capture or grab hold of because it is such a mysterious place in time and space. Of course there are levels in this aiki ranging from the artless, immature low level to the extremely complex high level. In this sense, training is really the striving of every individual practitioner to master the next higher level of aiki. It is not a type of thing where you can say that because you have received an explanation, you can reach the third level of aiki, or the fifth level, etc. In response to the physical nature of jujutsu, it may be better to say aiki is expressed as an effect on the spirit of the individuals involved. This aiki comes not from initiating an attack but only from waiting and intercepting (dissipating) an attack. When you initiate an attack you become unable to manifest this idea of interception; which is also the heart of self-defense. Finding a way to manifest this “absolute win” depends solely on the creation and extinguishing of aiki at the time you receive the attack. Well, as expected the phantom of aiki is not something that can be easily expressed by words, but I hope that you have at least managed to get a rough idea of what it is from the context of this discussion. I would also be very happy if you have gained a little understanding of why we say we recognize this to be a Kobudo, and practice it as an art. The basic techniques are exactly what their name indicates they are; each individual technique is similar to vocabulary words in their connected form of sentences. We call “aiki-jujutsu” the practice of the physical jujutsu under the concept of aiki. As I said before there are various levels of aiki. Since you must master each of them at a time, the things one practitioner can use or can’t, will vary depending on the individual. However, sooner or later you will get closer to the concept of aiki and your jujutsu training will become aiki-jujutsu. Also, because this is self-defense you must have a strong consciousness that is absolutely unforgiving. The very act of developing an unforgiving will towards “unreasonables” helps making grasping aiki easier. Because we are talking about actualizing a phenomena that has no real shape or form, you will probably never be able to truly understand it until you fully transcend your own set of ideas and way of thinking. This is because it is not useful to analyze techniques made by people if you are trying to transcend techniques made by people. After setting up a strong foundation in the basics, I would like us to train together in this deep, traditional Japanese martial art of aiki-jujutsu. All Editor’s Notes (EN) in this article were written by Christopher Caile, and are his own observations, not those officially representative of Okabayashi Sensei or Hakuho-ryu Aiki-Budo. They are based solely on his observations and understandings and he assumes all responsibility for any error, inaccuracy or omissions. (1)–EN: When Okabayashi uses the term “strength,” who most interpret as muscle power (characterized by use of the muscles of the arms, legs and shoulders), he uses this term as a concept distinguished from what might be termed “internal power.” This internal power is not something mystical (as use of qi or chi), but is generated through a combination of many factors internal to the trunk of the body combined with correct breathing and movement. For example, hip/koshi and shoulder/shoulder blade movement might be used to create an internal wave of energy transmitted through the limbs (which must be relaxed). When combined with correct body movement (dropping of the weight), efficient line of movement and use of the body center, a sense of unity is found between technique and the body that can be transmitted into technique. Trying to describe all these aspects is tremendously difficult and complex since components often vary with circumstance. Included too are such things is the use of an understanding of an attacker’s physical psychology – that is, the complicated auto responses and reflexes created by certain subtle moves. 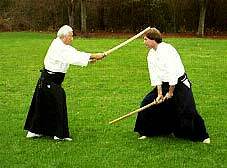 This method of utilizing the body (transmitting power) without relying on external strength found in Okabayashi’s teaching comes from methods utilized in Japanese Kobudo’s (classical weapon arts) gokui (high level know-how technique) of cutting and stabbing techniques found within the sword arts (kenjutsu). Every joint, all the way down to the lengthening and shortening of the bones, continue relaxing the very instant that power is transmitted through a particular point. During his study of Daito Ryu, Okabayashi also studied older Japanese texts on culture as well as martial technique and discovered that when techniques are applied with the movement used by modern man (use of strength), the techniques themselves change. He found that if the high level movements of ancient bushi (samurai warriors) were adopted the overall theory behind the techniques came together and the techniques passed down to him worked as taught. 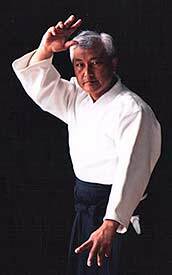 Thus Okabayashi now teaches within his art these ancient principles inherited from Japan’s high level Kobudo. It is interesting to note that similar internal power is also found within a few styles of karate and also several Chinese arts. In karate, for example, Kishiba Juku Karate headed by S. Shinzato Sensei (Okinawa), whose senior teachers include George Donahue, stress similar internal development of power (although they do not stress dropping the weight within straight line movement). In karate, however, this energy is general directed through a limb into percussion technique (s) as opposed to a lifting or other directional energy directed within the body as found in aiki arts. In addition, in karate multiple waves of energy are often directed into a single technique. Full discussion of this, however, will be left to other forums. (2) The term "shoden" (beginning/transmit), it is most often used to mean the 118 basic techniques of Daito-ryu classified into the ikkajyo, nikajyo, sankajyo, yonkajyo (or shikajyo) and gokajyo. (3) The Chuden waza (those above shoden) consists of: Aiki no Jutsu (53 techniques), Hidenougi (36 techniques) and Goshinyo no te (88 techniques). (4)-EN: In old time martial arts teaching, students were expected to learn by watching and participating, something often referred to as “stealing with the eyes.” During those time teachers had no written curricula or manuals (although lists of techniques by name were kept), nor did they generally explain or show in careful detail the method of their technique. Instead, students learned by doing and through experience, intuition and insight. (5)-EN: Within Okabayashi’s system, as well as most diato-ryu, aiki-jujutsu, jujutsu and aikido, technique is taught through kata, but not kata as found in the weapon arts or karate. In the former, students are taught short responsive methods (technique) that are designed to respond to certain attacks. These often only have a few movements, but are usually strictly defined in terms of movement, angles and direction. Thus, they comprise short kata. (6)-EN: An example this observer experienced was when Okabayashi asked me to grasp both of his wrists as hard as I could. I outweigh him probably by 60 pounds and am much larger and stronger in terms of pure physical strength, yet I found myself upside down in the air propelled 360 degrees to his side. I have no idea what he did. I didn’t feel much movement and when I asked his students what he did, they couldn’t really explain. His movement seemingly was very small – but this 220 pound man was thrown effortlessly. Okabayashi Sensei studied Daito Ryu Aiki Jujutsu mainly under the late Takeda Tokimune, 36th Soke (Takeda Sokaku's son), and Hisa Takuma, Menkyo Kaiden of Daito Ryu (one of only two people Sokaku Sensei ever awarded this rank to). Sensei also trained in Ono Ha Itto Ryu Kenjutsu exclusively under Takeda Tokimune and holds a Menkyo in this system. Training with Takeda Tokimune, Okabayashi received the title of Kyoju Dairy in Daito Ryu. Kyoju Dairi means assistant teacher and represents the mastery of the following techniques: shoden (118) techniques, aiki-no-jutsu (53) techniques, hiden okgui (38) techniques and goshinyo-no-te (84) techniques (although it should be noted that Okabayashi helped organize this progression of techniques within Tokimune’s system). The Hakuho Ryu Aiki-Budo was formed by Okabayshi Shogen Sensei for the goal to preserve the traditional kobudo body movements of the bushi and the Hitoemi principle that are fundamental to the classical Japanese fighting arts including Daito Ryu and Aiki-Jujutsu. Sensei's goal is to preserve Aiki-jujutsu and Ono Ha Itto Ryu Kenjutsu Sakaku-den in their original form.